What better place to stay on the beach than in sunny Southern California! 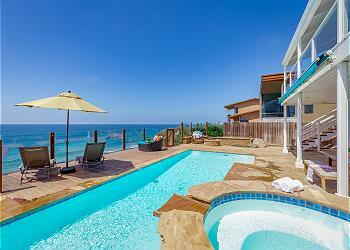 Our beach vacation rentals are all located in close proximity to California’s major attractions. The San Diego Zoo, Safari Park, Legoland, Seaworld, Disneyland, and Universal Studios are an easy day trip for you and your family. Our California beach rentals are all located in North County San Diego, which is approximately 30 minutes north of Downtown San Diego. Western North County is made up of quaint coastal towns, each with their own vibe and that laid back California beach essence that everyone loves. Our rentals are in the cities of Carlsbad, Encinitas, and Oceanside (Oceanside being the northernmost San Diego town). Immerse yourself in 50 acres worth of colorful, gorgeous flowers at Carlsbad Ranch this spring. The 2019 San Diego County Fair will be an Oz-some time for the whole family, featuring a "The Wonderful Wizard of Oz" theme. From historic sites with free roaming peacocks to the best hidden surfing spots in town, here are our picks for the top 6 things to do in Carlsbad, California. Dip your toes in the cool water of these San Diego area waterfalls after a long hike.